In this tutorial we will explore the option to install a specially designed download for MacOS. NOTE: If you are using Windows, Linux, MacOS and have your own setup of a LAMP, XAMPP, WAMP, MAMP or any other stack that has PHP+MySQL running, then you can simply use this barebone method of installing only the wireframe files. 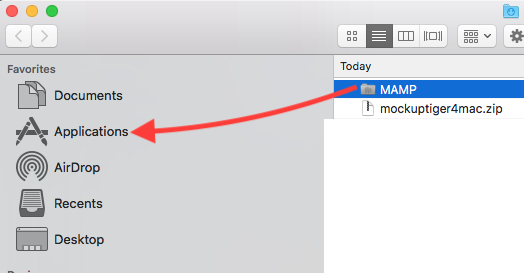 Please note that the MAMP folder should not be renamed to anything else. Right click on this file and select "Open"
The services will keep running until you shutdown or decide to stop the processes. To stop, locate the "_stop_MockupTiger.command", right click and select Open. This will close all MockupTiger processes.